M3-FS focus modules add high-resolution lens motion, with excellent dynamic stability, to the smallest OEM cameras. 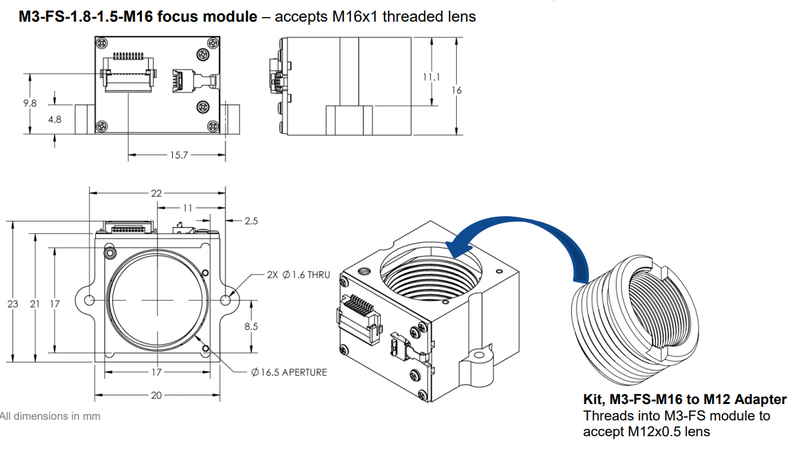 Each module is a complete closed-loop motion solution and requires no more space than a typical fixed lens mount. Very low power is needed to move the lens and zero power is needed to hold the lens in any position, making the M3-FS ideal for battery-powered devices. All M3 smart modules have embedded closed-loop control. They need only simple high-level motion commands from the camera processor, making system integration fast, simple and cost-effective. Precise lens position control (0.5 µm resolution) and best-in-class bidirectional repeatability enable you to capture the sharpest images in the shortest time. Designed for long life with high performance, M3 modules are not susceptible to temperature or power variations. 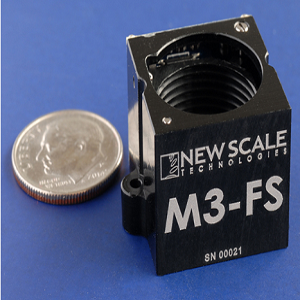 The new M3-FS focus module is a drop-in replacement for the original M3-F focus module. The aluminum structure and innovative ball bearing guide mechanism deliver a 3x improvement in tilt and accuracy. The new M3-FS features superior dynamic stability, minimizing pixel shift with changing camera orientation. This makes it ideal for miniature handheld, portable and mobile systems. Maximum lens diameter is M16. Both the M3-FS and M3-F smart focus modules feature embedded closed-loop control. You provide simple, high-level motion commands from the camera processor over a standard I2C or SPI interface.